I really had a hankering to build a guitar. You know...we talk a lot about guitars and their construction around here. I wanted to have the experience of building at least one. I was eyeballing one of the StewMac kits. But, being a book-smart academic type, I have no experience with any kind of skilled hands-on work, no tools and not a clue. "I don't have a drill to mount my vice." OK...I do have a drill. 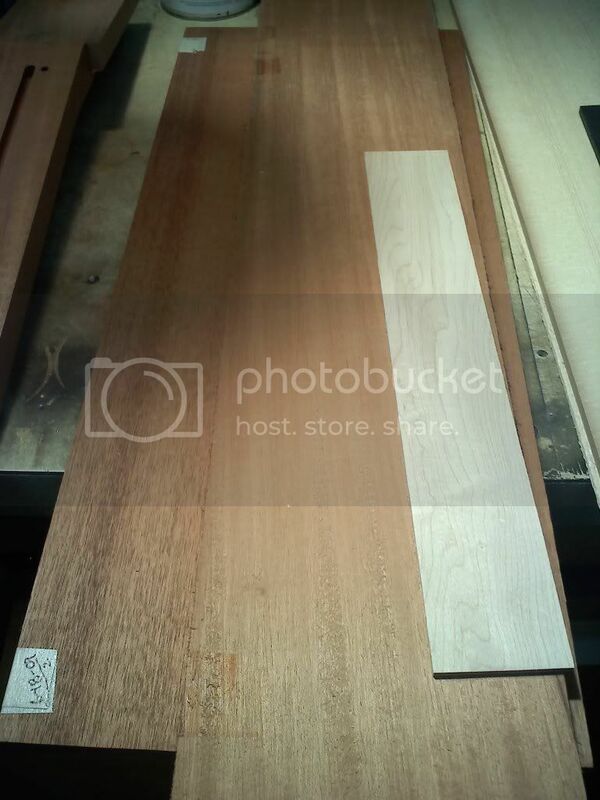 I called a local luthier, Larry Nair (Tahoe Guitars), to ask if he would help me build a StewMac kit. He said we could do that, or he and I could make a kit and he would help me build it. Wow...hard to refuse that one. Long story short...my Mahog/Adi OM is under way. It is based on a vintage Martin OM-18. 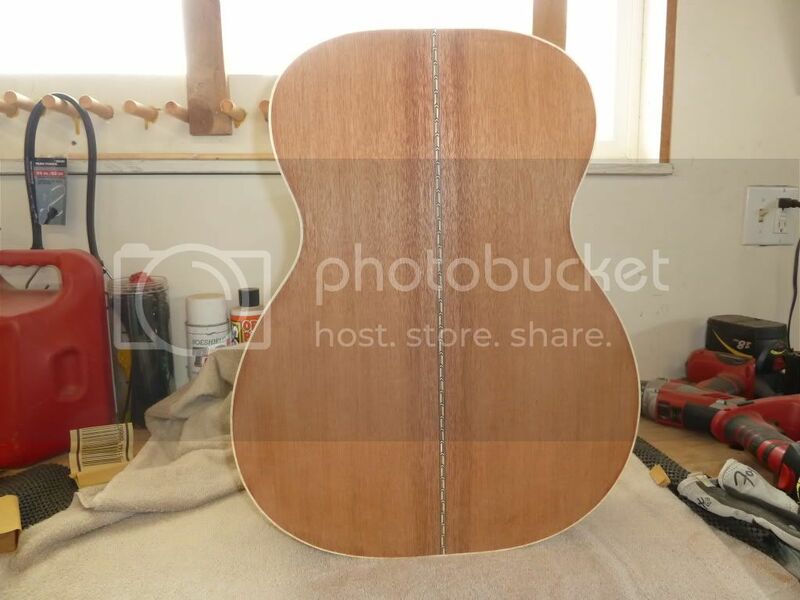 I chose a stiff, ringing Adi top, a subtle Honduran mahogany B/S set, Honduran mahog one-piece neck . She'll be bound in curly maple and have a diagonal check top purfle and a chevron backstrip(my box from LMI just arrived ). 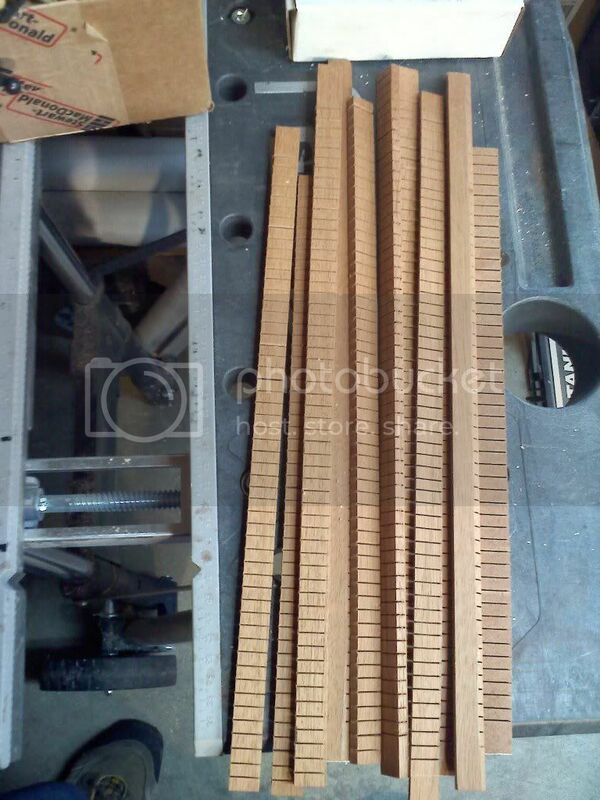 We're using a piece of macassar ebony which I bought last summer to make the bridge and a matching headplate. We're incorporating a few differences in the bracing and top thickness, and going with a deeper body and a a two-bolt MT neck joint. It has been quite an education thus far. My mentor is quite skilled and has a keen eye and intuition about tools and methods. He has many home-made jigs and helper tools. e.g. he has a little kurfing jig that allowed me to cut the requisite amount of reverse kurfing for the guitar. 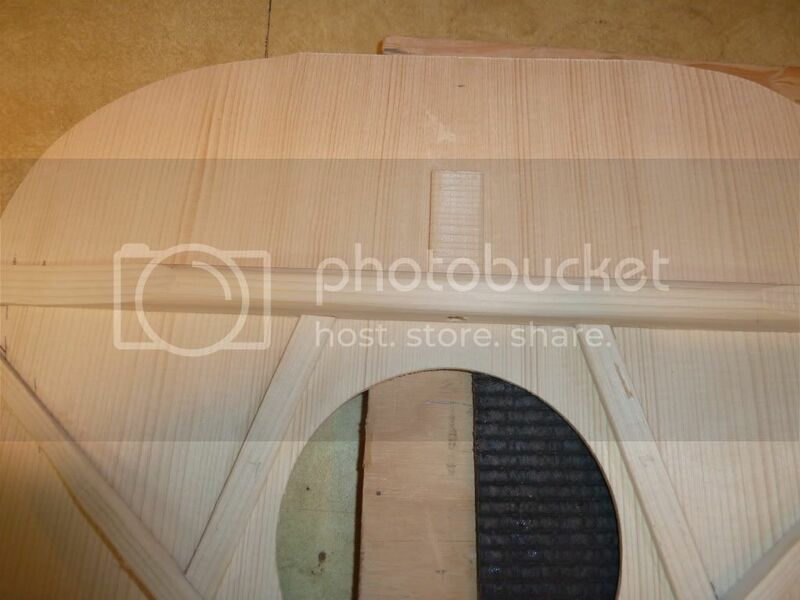 We then pre-bent the kurfing to prevent breakage. I'm pretty much in awe of his "mad skills". This really is/has been a unique opportunity far beyond what I would have had with a StewMac kit. 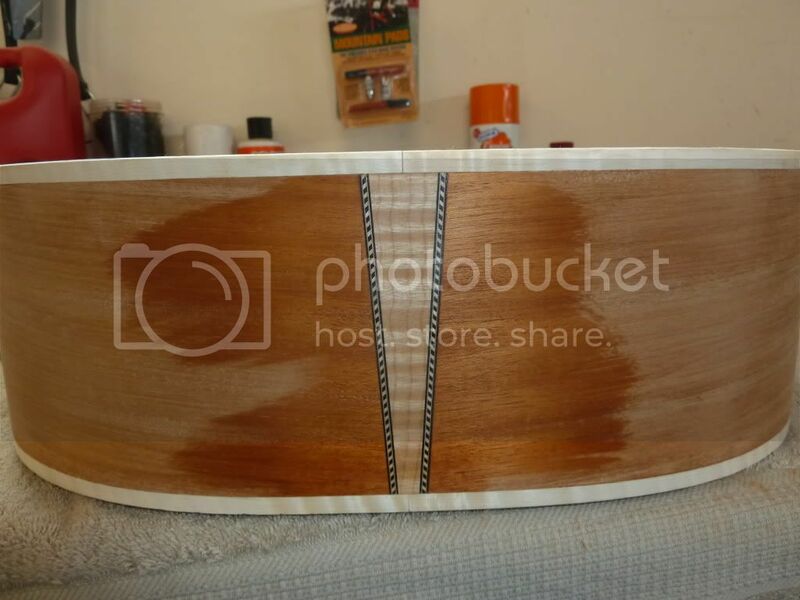 I've assisted with, done myself or at least wittnessed most of what Stew Mac would do to prepare a kit: choosing wood, bending sides, joining plates, etc.. I spent yesterday afternoon shaving top braces and tapping. 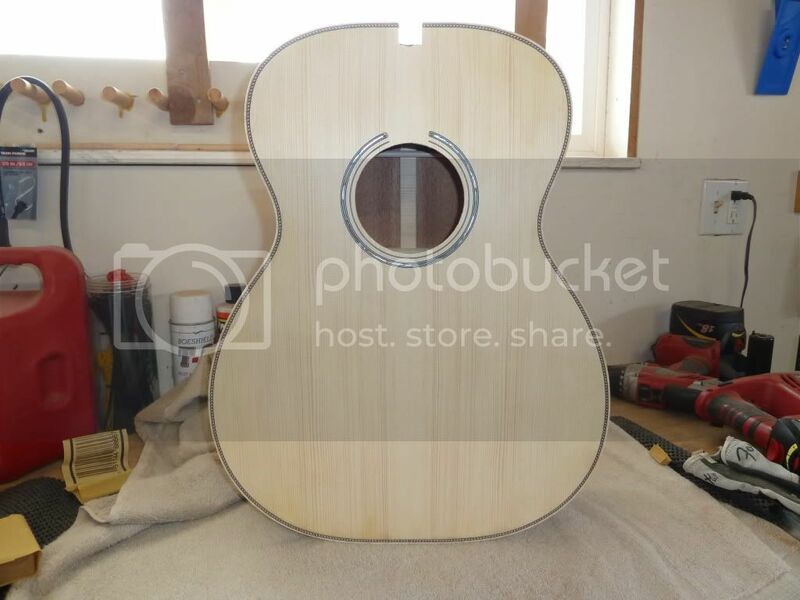 I have no idea what the tone coming from the braced top was telling me, but it is quite musical and really "settled" on a nice tone as I carved. We just glued to top on the sides last night. So here are a few pics and a link to a bunch more. I'll update the thread as we progress. Last edited by OddManOut; 02-22-2011 at 08:50 AM. you must realize how lucky you are. amazing! please keep posting pics of progress. looks very nice. sooooo, popsicle brace, yes or no? Thank you. I, too, am pleased with it so far. 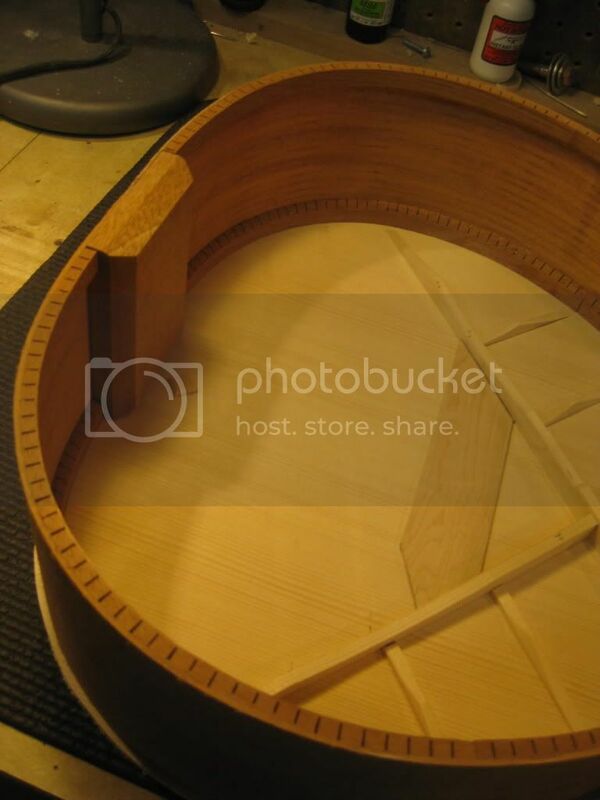 Yes, I feel very fortunate to find a luthier like Larry who is both local and interested in teaching luthierie. I lucked into a very good situation with a guy who could not be more patient. No! Larry views it as a structural choice. I view it (in my "expert" opinion) as freeing up the top a bit. One of my Collings has no tongue (popsicle) brace (and a darn fine sounding guitar it is), so we looked in there to see what they did to deal with its absence. They have a strip of mahog on the center seam. We went with a strip of Adi as sown below. Note also we tucked the tone bars and finger braces under the X-brace, capped the X with an Adi cap, and faded to nothing the lower ends of the X-brace. The same was done with the ends of the finger braces (shaving was not complete when this photo was taken). The other ends were brought down to 1/10", which Larry tells me is a Martin standard. Everything above the bridge plate remains flat or convex. Below there is some scalloping action. Last edited by OddManOut; 02-22-2011 at 07:43 PM. No! Larry views it as a structural choice. I view it (in my "expert" opinion) as freeing up the top a bit. Larry is correct, and you are not freeing up the top by not including it. The huge massive honking brace right below where it should be effectively cuts off the vibrating area of the top. And Somogyi says you shouldn't even taper that transverse brace (like everybody seems to). It is purely structural, and the beefier, the better. Many would agree. Bill Collings wouldn't. Of course if the transverse brace stops all vibrations then why does the choice of neck material have an effect on the sound of the guitar? The best evidence that the neck makes a difference is to play a guitar with a rosewood neck. I don't pretend to be an expert as I am hardly that. I'm only suggesting that the issue is not so cut-and-dry. I'm only suggesting that the issue is not so cut-and-dry. I agree with this. My main problem with the popsicle brace is that it doesn't work. There are plenty of examples of old Martins with popsicle braces that developed cracks near the FB extension in precisely the same way that other examples without popsicle braces have. I have to believe that more mass glued to the top is still more mass glued to the top. I like the solution in the photo. 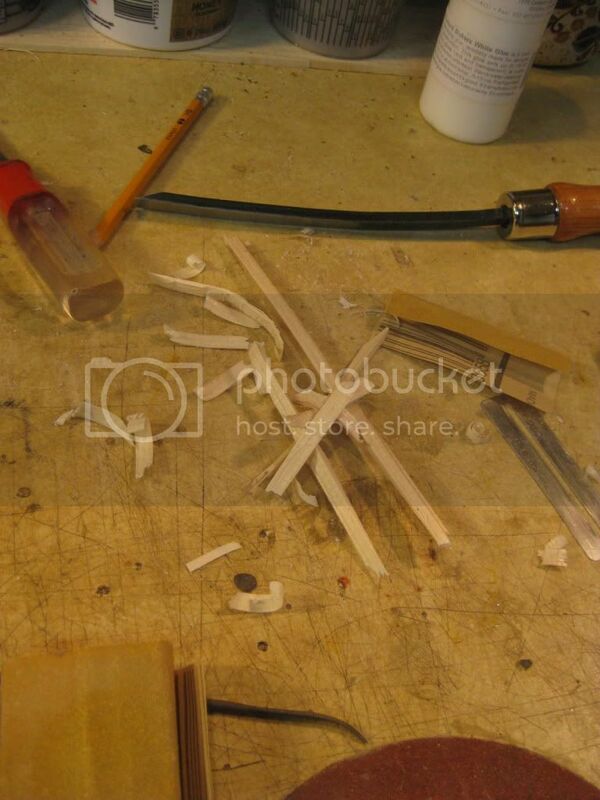 Another thing I've heard folks will do is to use a small amount of glue under the fingerboard extension. just enough to keep it from squeaking, but little enough so that movement that would have caused a crack, just frees the glue instead. 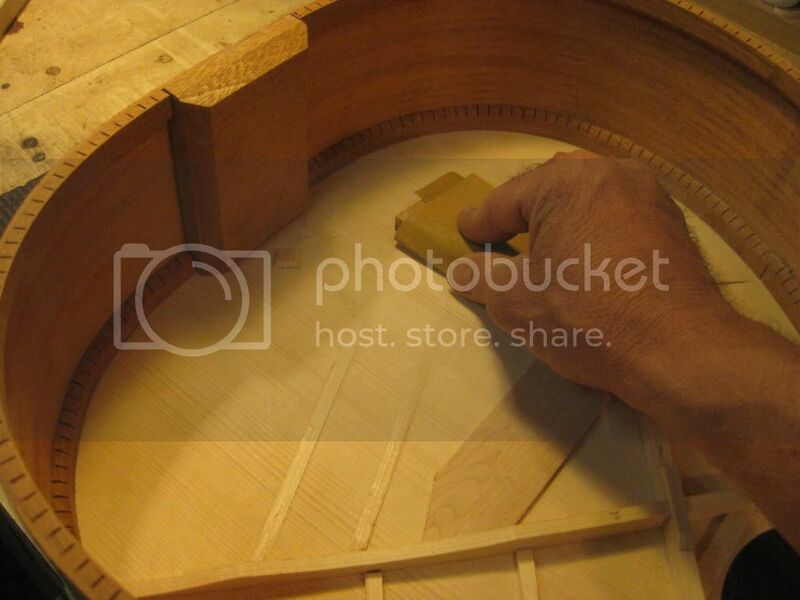 it would be a lot easier to fix that then it would be to fix a cracked soundboard. the pics look great. man. left handed, eh? then why does the choice of neck material have an effect on the sound of the guitar? 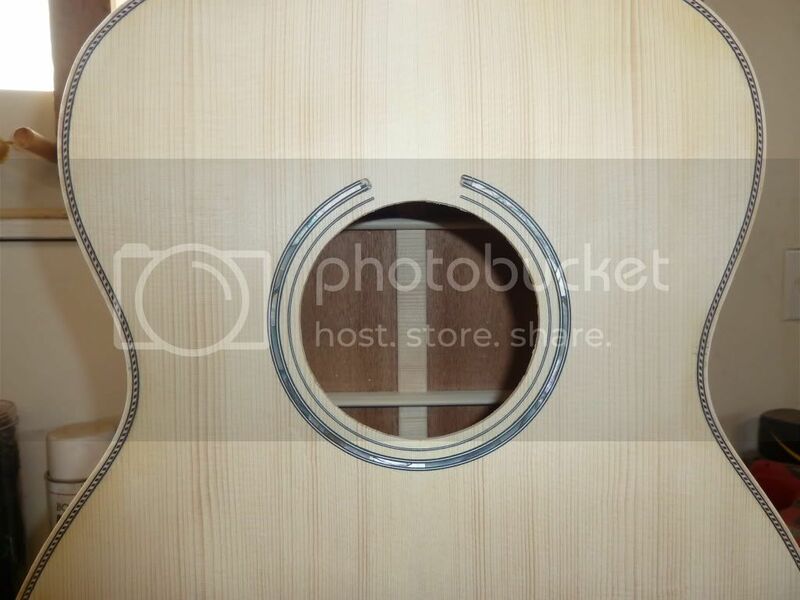 The strings are directly attached to the neck. The saddle and the nut are the two terminal ends of the vibrating strings, so the nut is trying to vibrate just as much as the saddle. The more massive the neck, the more the nut will "resist" vibrating, and the more the energy gets "channeled" to the saddle. Very cool OMO! I'm building my first 2. Almost done with the 1st and in the middle of no.2. I also was able to find a relatively local luthier, John Hall of Blues Creek, here in PA and his help has made all the difference. Don't be shy with pics. I'll be putting up pics of my first when it's done in the next week or 2! It's a 12 fret 000, EIR/ Sitka slothead. Like yours, based on a classic Martin design. Best wishes! Just a quick update on the progress of my mahog/Adi deep body OM. ...the pics look great. man. left handed, eh? Sadly, the answer is no. The tone bars were backward. I'm glad you caught this. Thank you. I called my mentor and he responded with the version of "Oops." that begins with the letter 'F'. 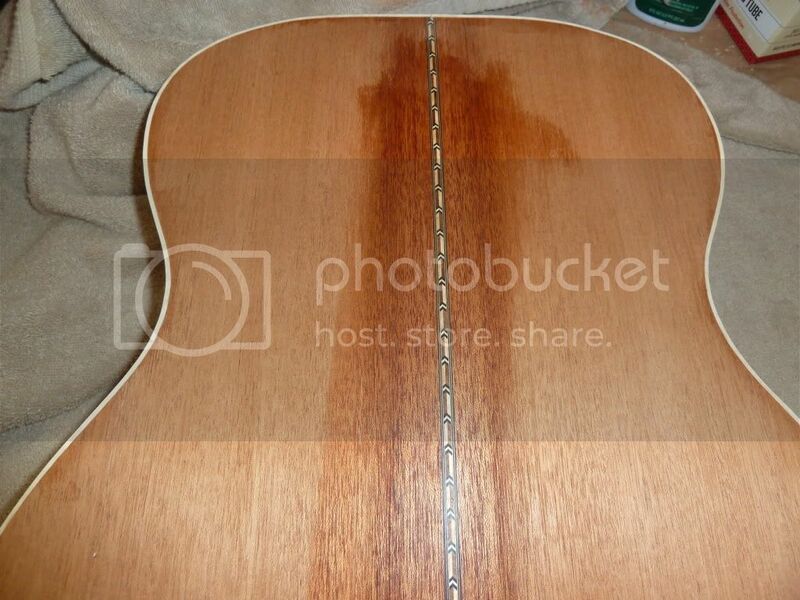 I guess the tracings were taken from the top of the vintage Martin. Larry forgot to turn them over. He felt bad. 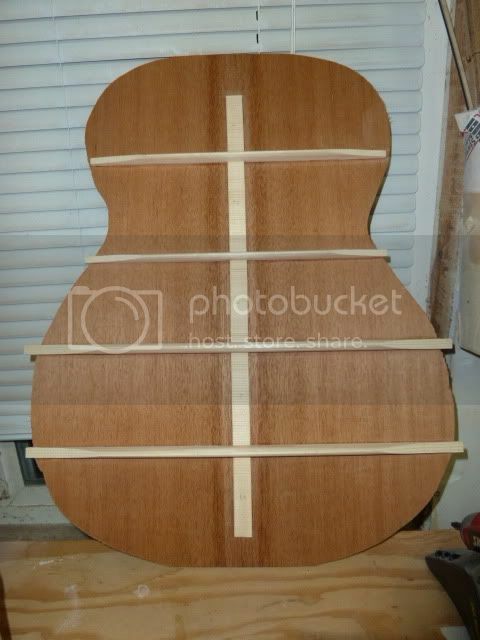 I called a couple of luthiers to ask their opinion as to whether we should redo the tone bars. One said "yes", the other "don't bother". They each gave their reasons. These discussions in and of themselves were an education. After discussion and thought, we decided to do it right...redo the tone bars. Larry did a fantastic job of getting the old ones off and gluing up new ones (all the with sides on, mind you). The new tone bars are butted, not tucked (too hard to cut the pockets with the sides on) and barely a shadow remains of the old. 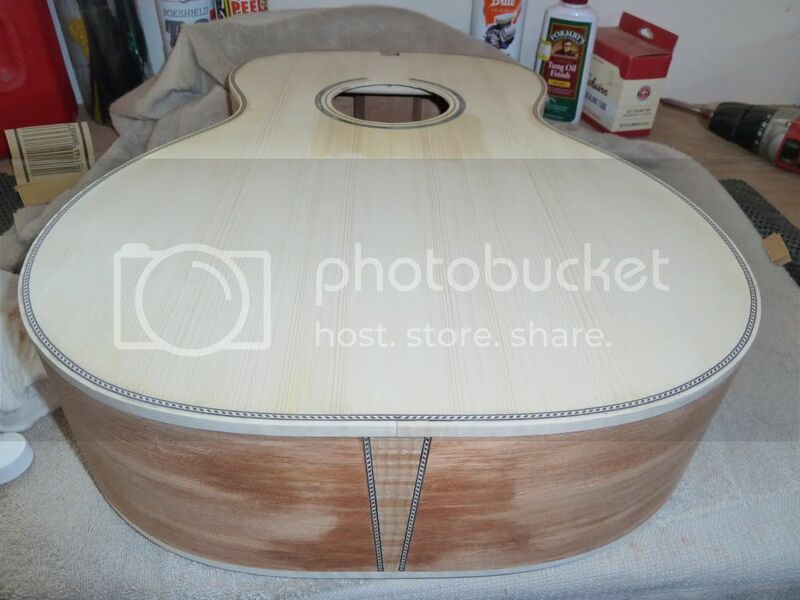 We recarved the tone bars, glued on the back, routed out binding, purfling, backstrip and tail wedge channels, glued up all of the trim elements. 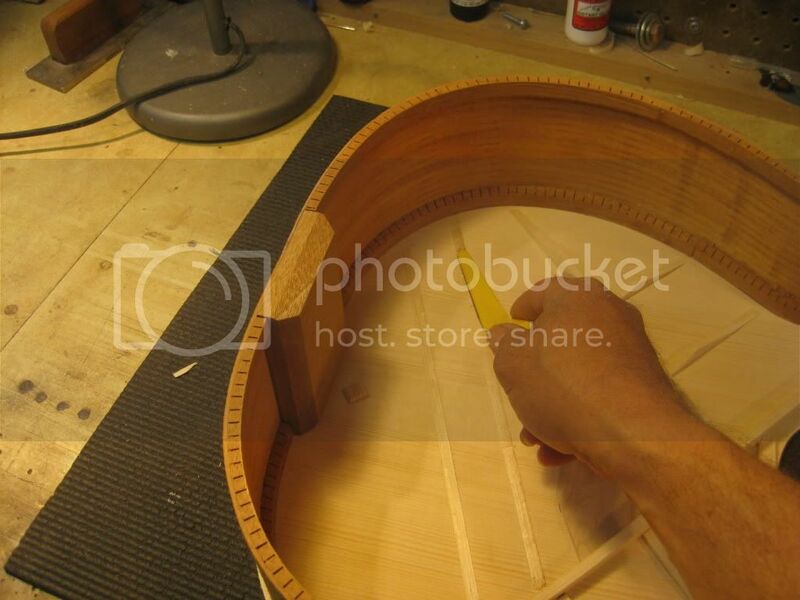 The new pics were taken as I was sanding the box. I'm at 220 grit at the time of writing. 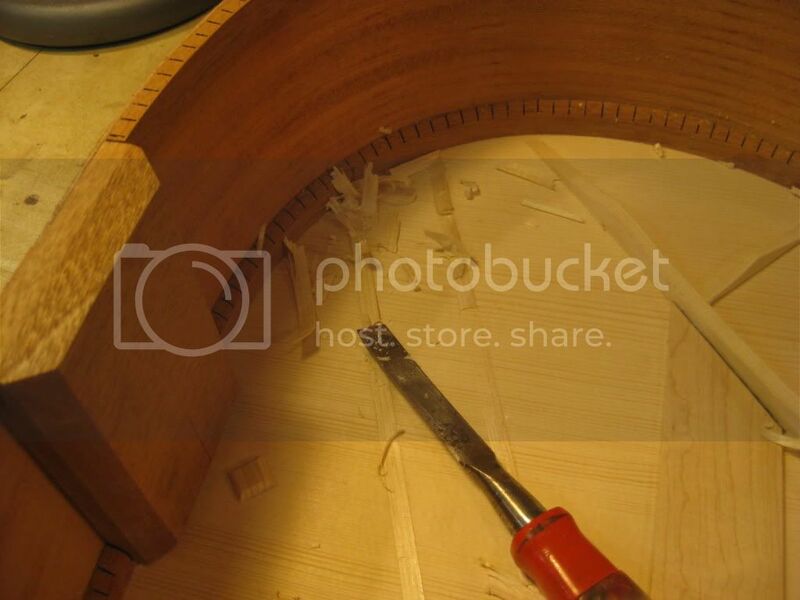 One of the design elements was the orientation of the diagonal check purfle against the maple tail wedge. In the end I chose to oppose the diagonal check and the wedge to make it look like the purfle is supporting the wedge. What would you have chosen? One thing I would do differently is go with the diagonal check for the rosette as well. We chose the green shell (Larry did the inlay) prior to the choice of the diagonal check. Larry was assuming a BWBWB purfle. The next big job is to tackle the neck shaping. Larry has an angry-looking rasp that likes to eat mahogany for lunch. Should be fun. Last edited by OddManOut; 02-22-2011 at 07:46 PM. My understanding is that the orientation makes no difference, but I would have liked to hear the discussion. So you decided not to tuck the lower legs of the X into the kerfing? I'm curious if that was discussed -- I've always wondered if tucking was necessary. Seems like it shouldn't be, but everybody does it. Luthier #1-a luthier of noted talent-said that, in theory , the reversed orientation would tighten the bass side and loosen the treble. Thus, in theory, it would push the tone toward the mid. In practice, he said, he didn't know what would happen and it was not a risk he would want to take. Luthier #2- a longtime repair guy- said that he's converted a number of left hand Martin to right handed and they sounded just fine. Larry and I believed the latter, but wanted to do it right on principle. When I saw the tidiness of Larry's fix, i was really, really impressed! I don't remember now which ends were faded out and which were tucked. I think we faded out the lower bout ends of the X, tucked the upper ends. Last edited by OddManOut; 02-18-2011 at 07:09 PM. As metioned above, Larry and I mistakenly set the tone bars in a left-hand orientation. Although probably not necessary, we decided to correct the error out of principal. To my surprise Larry documented his work on the fix. I though I would share some of the pics. Pretty clean removal, no? Wait a minute. I thought this was *your* build. Did he reshape the bridge plate when he change the tonebars?